Our Power Skate n' Swim campers will participate in daily power skating sessions with trained instructors that will improve their speed, power and edgework through a variety of on ice challenges taught by trained instructors. All participants are required to where full hockey equipment including and have some basic skating experience. 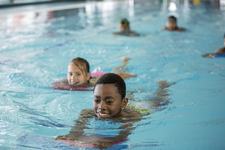 Beyond the ice campers will complete Red Cross Swimming Lessons daily at Forbert Pool as well as a variety of fun and interactives games and activities. This will be an exciting and challenging camp that will improve your skills on the ice and in the water.